The durable SWIMTAG Wristband has a streamlined design and adjustable strap which has been designed and tested specifically for swimmers, minimising any resistance in the water and ensuring a comfortable fit for all users. Made from a thermoplastic elastomer, its 100% recyclable and has excellent resistance to chemicals and UV light. The Wristband can record up to 7 hours of continuous swimming data in a single session. Once returned to the Docking Station the Wristband is ready for the next swimmer in a matter of minutes. The SWIMTAG Docking Stations issue Wristbands to swimmers, download swim data and re-charge the Wristbands. The Docking Stations can be managed by reception staff or offered as a self-service system to swimmers. Each Docking Station can manage up to 40 Wristbands with 5 bays (mini-Club SWIMTAG) or 10 bays (Club SWIMTAG) available to download and charge Wristbands simultaneously. The Docking Stations connect to a compact computer via USB to process and upload swim data to the Website. Pools can either use their existing membership cards with the Docking Station or bespoke SWIMTAG cards. RFID/MIFARE, QR code, magnetic swipe or barcode cards readers have all been used at existing sites. Swimmers can also use the SWIMTAG mobile app to activate a wristband. The swimmers can present their app QR code in front of a scanner at your docking station to activate a wristband. Ideal if they forget their membership card and don't want to loose their swim record! Our new lane displays are a great way to further improve the user experience at any SWIMTAG pool. 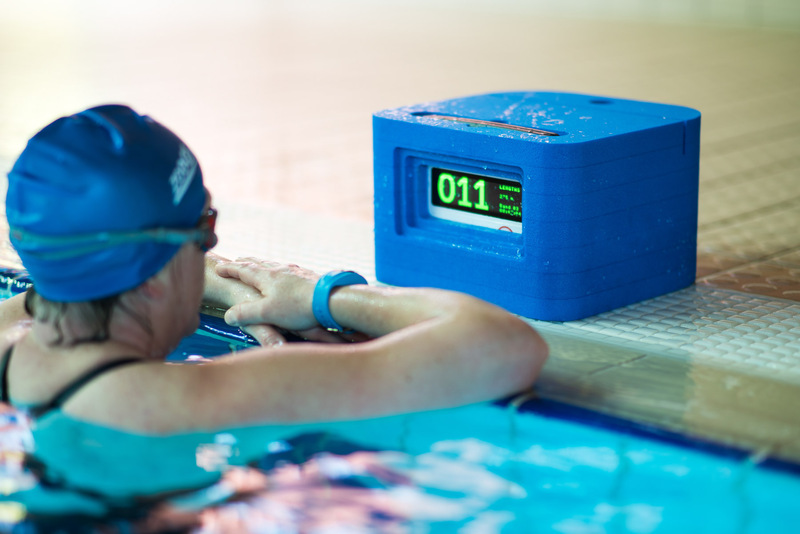 The robust screens lets swimmers know how many lengths or how far they have swum in real time and can also be used to help them keep to a set pace. The large bright digital screen is easily seen, even through misty goggles. The swimmer simply raises their band in front of a screen when they want to see their stats. The blue foam casing means that they blend into the surroundings of the pool and there's even a slot on the top to put your "slow lane / fast lane" signs. The lane displays have been hugely popular with SWIMTAG users - they no longer see their swim notification and realise they've only done 98 lengths when they were planning to do 100! We have three options for the SWIMTAG Docking Station computer. In all cases the Docking Station tower connects via USB to upload swimmer's swim data to the website. The energy efficient Zotac Zbox has been our top choice for the SWIMTAG Docking Station computer for the last few years. The small form factor hardware has ample power and sits discretley under the reception or on the back of a monitor with a vesa mount. Operators requiring a self service SWIMTAG system will be delighted with the look and feel of the Aures Yuno. The Yuno is a robust but stylish and compact product ideal for operating the SWIMTAG Docking Station at your pool reception. It is a fanless, compact, high-performance system equipped with a shock-proof and scratch-proof, multi-touch, projected, capacitive screen (PCAP technology). As standard the YUNO is stand alone however it can be wall or pole mounted. The Yuno is supplied with a fantastic 3 year warranty from Aures offering a sensible, cost-effective and long-term investment your SWIMTAG system. We also offer imageHolders Shell+15 enclosure as a highly secure kiosk solution which is designed for use in heavy footfall environments. The Shell+15 enclosure can be mounted on a custom swivel mount or a fixed arm and branded with your operator logo. The Shell+15 encloses an Aures Yuno touch screen and card reader enabling swimmers to quickly and easily activate their own SWIMTAG.